Last day for orders Thurs May 2nd, reopen Monday May 13th. Last day for orders Thurs May 30th, reopen Tues June 11th. 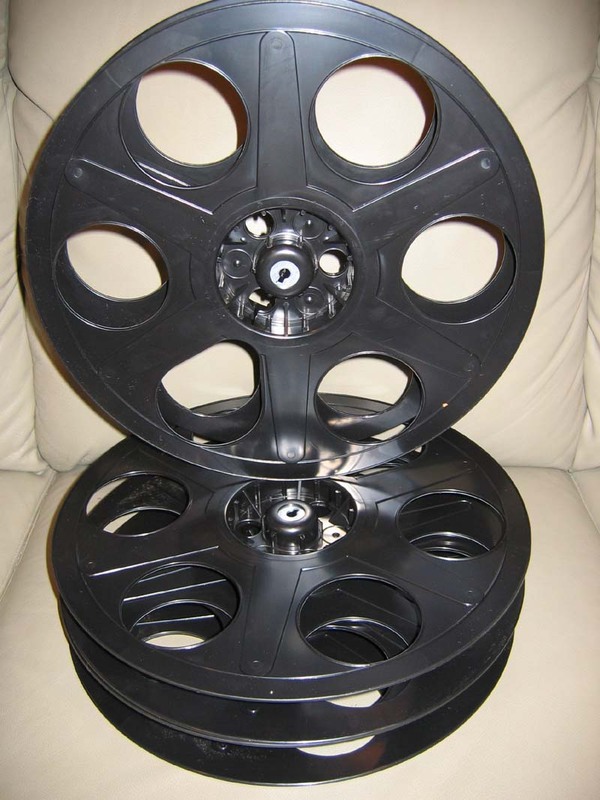 16mm New Plastic Film Reels & conventional Cans--Gray unless noted. If conventional can not listed choose archival cans in next table. We will substitute colors if you don't specify. 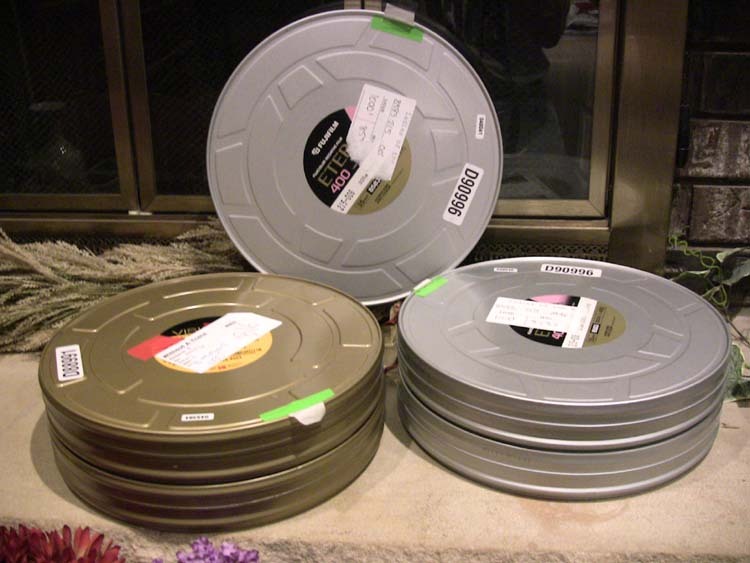 The Archival cans below are made of inert polypropylene plastic, which is proven safe for film. They look and protect like other plastic cans, but they are designed to "breath"...and allow for fresh air circulation. This design helps combat vinegar syndrome, keeping your films healthy for short or long term storage. Now the collector, library, and archivist can obtain archival cans for their collection. 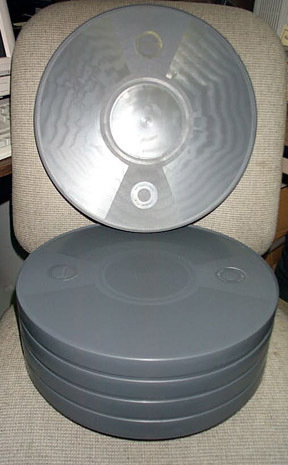 Archival plastic cans are now used to store films of the major studios, the Library of Congress, and the National Archives. 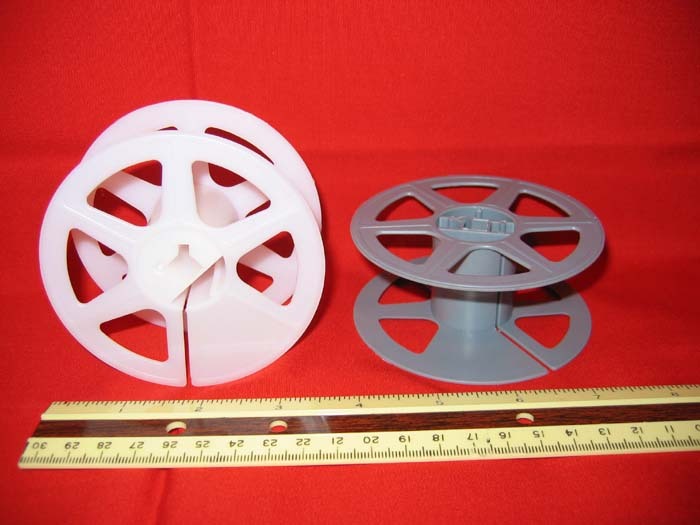 These archival cans can be used to store your films on a reel, or a core. 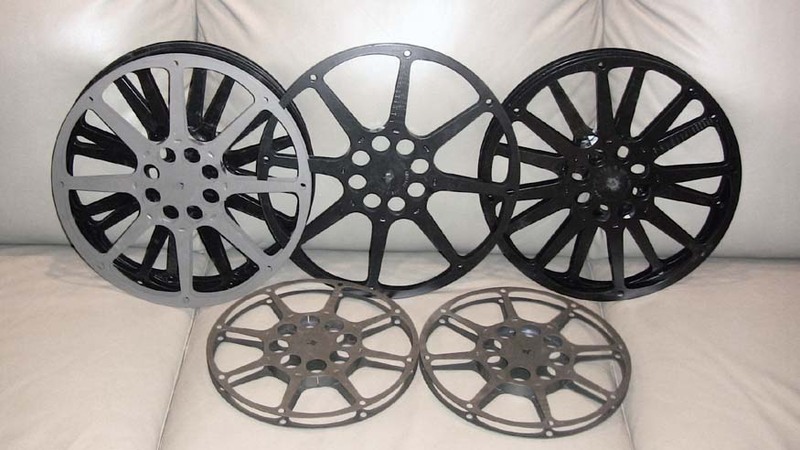 Used Film Reels and Cans, 16MM, 35MM (inquire on availability) We will send our choice (steel or plastic) if not specified in chart. Some sizes are limited quantities. 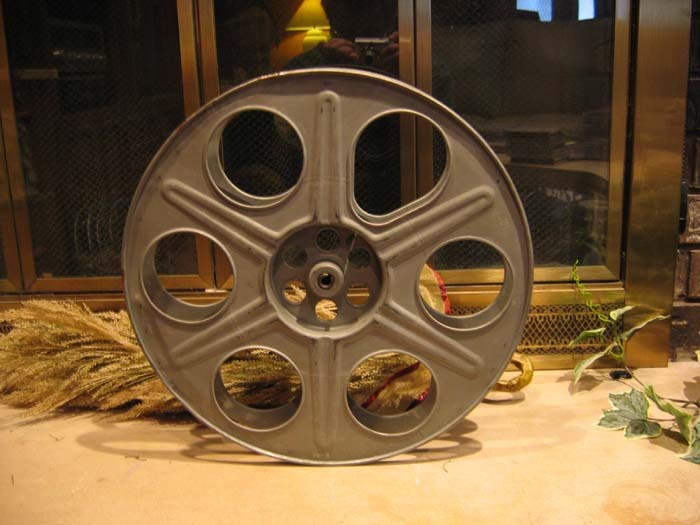 ANTIQUE FILM CANS FOR DISPLAY OR MOVIE PROPS-- PICTURE 1 PICTURE-2 If you are in need of steel film cans for movie props, projection or media rooms, art projects, parties...we have actual film cans more than 50 years old. The picture represents some of the cans we can offer. They are old, aged, and worn. Those in the picture are priced from $6 to $15 each, depending on size. Call us for further information. 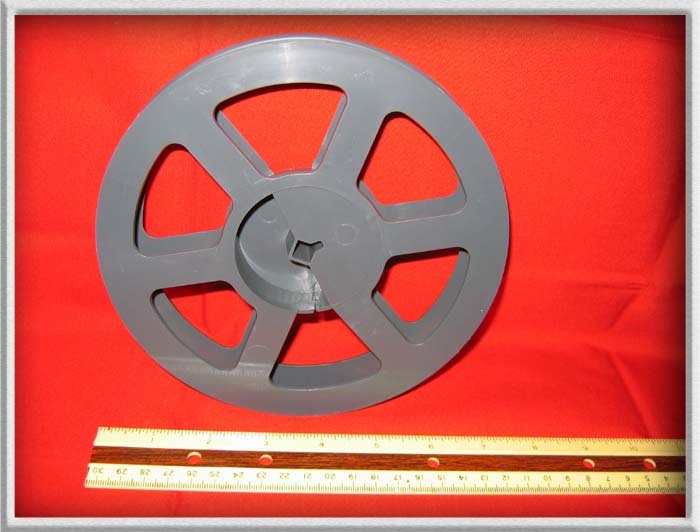 16mm Budget Clear Leader - Polyester (Mylar). 100ft..single perf...Good for leader, experimentation, student painting or marker animation...washed recycled film...may have some minor abrasions, still fine for all purposes ...$9.50 Green product, recycled film base. 16mm Clear Double Perforation Leader - Polyester (Mylar). 1000ft....Good for leader, experimentation, student painting or marker animation....washed recycled film...may have some minor abrasions, still fine for all purposes... $49 Green product, recycled film base. FILMRENEW. 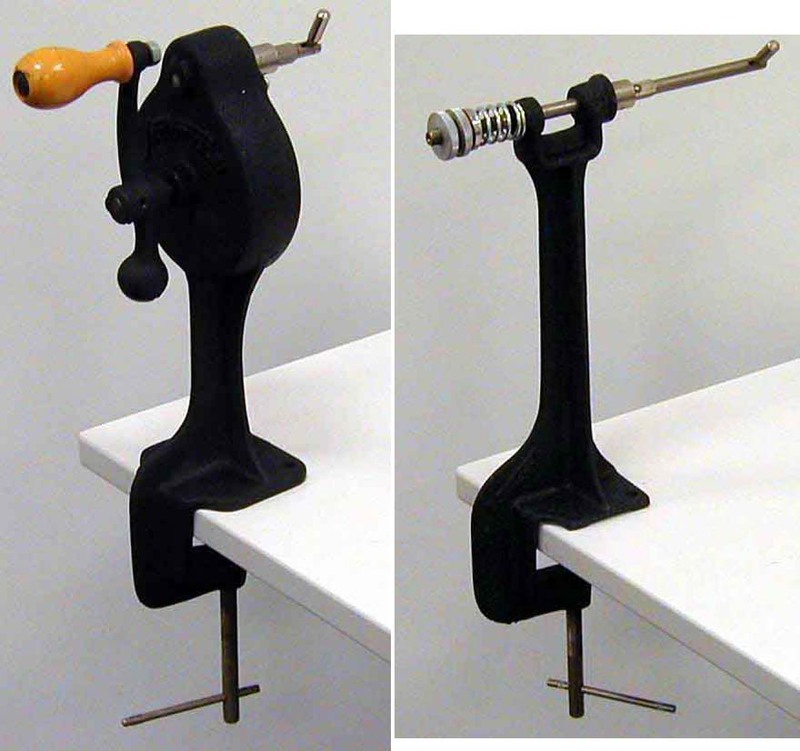 Slow drying, penetrating, keeps film pliable while lubricating and waxing. Immediately kills mold and fungus. Ideal for older films, as well as "green" new prints. Apply between rewinds, brush on sides of reel, or soak. Very gentle on films. 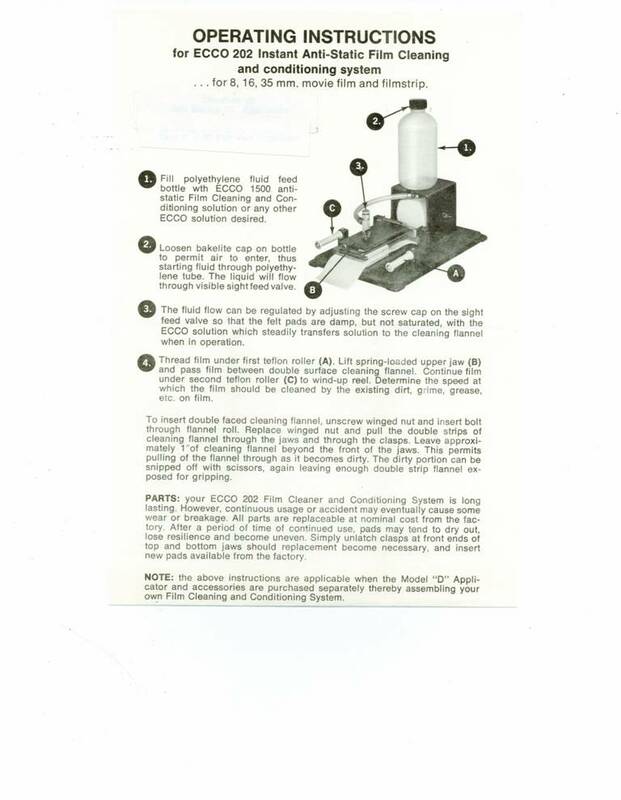 $79.00 per gallon (8 pounds), $30.00 per quart (2 lbs). FILM CLEANING CLOTHS. Compatible with all film cleaner, including Filmrenew, Solvon, and Edwal. Approx 12 inch x 10 inch squares...Excellent size for hand cleaning applications...made of soft, absorbent 100% cotton...works great! Each...$1.75, or 12 cloths for $18. SOLVENT GLOVES High quality solvent resistant gloves for use when hand cleaning film with film cleaners. When using film cleaners it is always recommended to wear solvent gloves. Available in Medium (most women) or Large (most men) sizes. Please specify. Two pairs for $12, or $6.50 a pair. TAPES, TAPE SPLICERS, CEMENT SPLICERS Click here to visit our Presstapes page for application instructions. 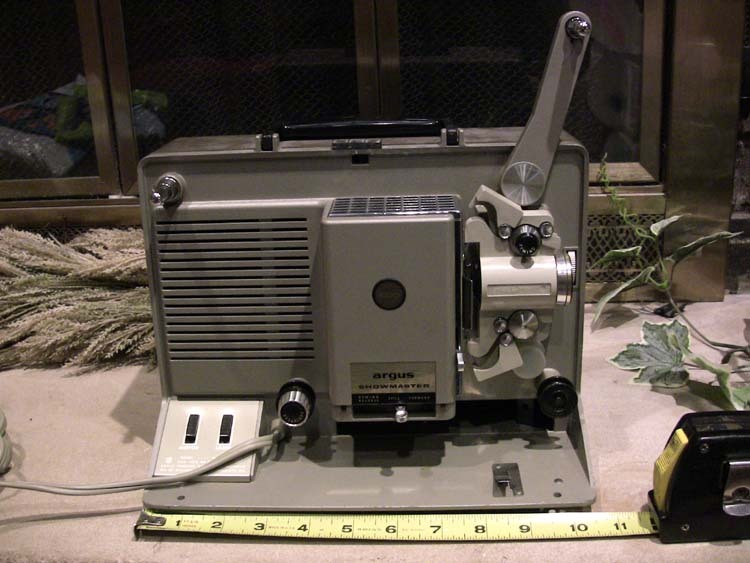 REGULAR (STANDARD) 8MM PRESSTAPES. 20 splices per package (40 tapes) per package....$3.50. REWINDS, ACCESSORIES all items used and reconditioned unless noted. 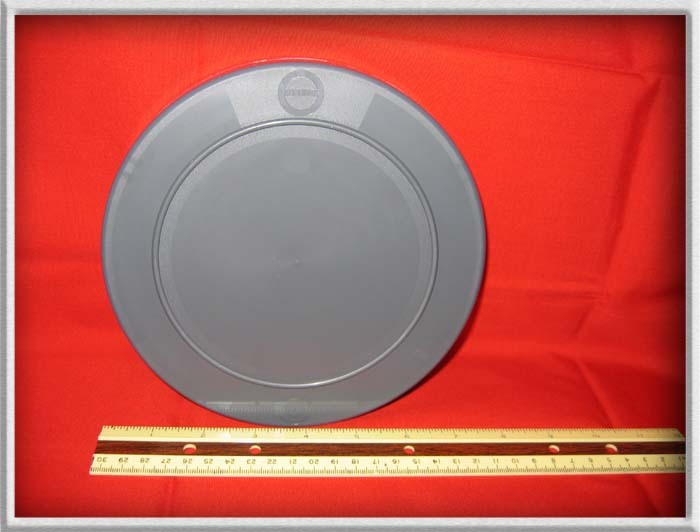 PROJECTOR MOTOR, ARM BELTS For the Eiki projector..we have the round rubber motor belts and arm belts ..$10 each. CORES 16mm, 2 inch cores. Each. 50 cents not reconditioned. May have tape residue, markings, dust, etc. CORES 35mm, 2 inch cores. Each 45 cents not reconditioned. May have tape residue, markings, dust, etc. We accept Visa, Amex, MasterCard, Discover, Pay Pal.